Izzy Brown hopes to help Albion bounce back from their defeat to Liverpool at the weekend and says he will give 100 per cent whether he starts or comes off the bench. Brighton travel to Huddersfield - where Brown spent the second half of last season on loan - on Saturday. The attacking midfielder made just his third start of the season in the 5-1 defeat to Liverpool, after a stop-start beginning to the campaign. Brown, on loan from Chelsea, started the season-opener with Manchester City but suffered a hamstring injury early on and that ruled him out for six weeks. 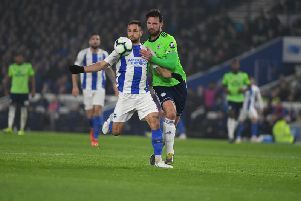 His next start was the 2-0 defeat at Arsenal but Albion then went on a five-game unbeaten run and Brown found game time limited. The 21-year-old was pleased with his performance against Liverpool and also impressed Seagulls boss Chris Hughton. Brown said: "When I came off, he (Hughton) said I was excellent today. I just want to try to play week in, week out. It hasn't happened like that so far but hopefully my performance today is going to change the manager's mind. "If next week I start on the bench, I'll still give 100 per cent for the team but I want to be playing football as much as I can. "The boys have been doing so well, so I can't complain. They've been excellent and have been getting the results they needed, so I've been happy coming on and helping the team when I can but to get the start today was great for me because I've been working hard in training and giving 100 per cent. "I haven't let my head drop when I haven't been in the team. To lose today is disappointing for me but I thought my overall performance was good. I made some good crosses but the most important thing was the win and we didn't get it today, so I'm upset."